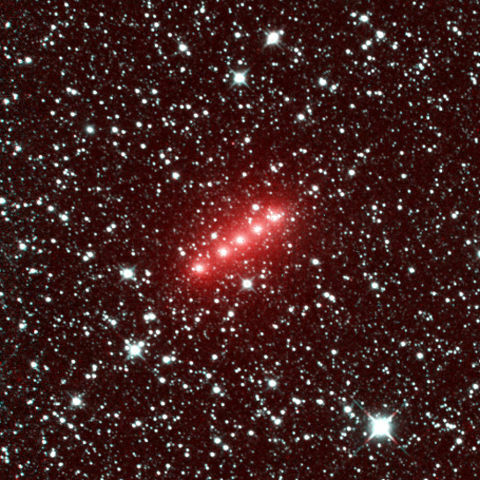 NASA’s NEOWISE mission had been on a ‘comet hunting’ mission for the about a year and had a few hits, including Comet C/2014 Q2 (Lovejoy). This image shows Comet Lovejoy, which was about 245 million kilometers from Earth, moving in a (mostly) west and (slightly) southerly direction. The comet’s coma (this is what surrounds the nucleus of a comet) is made up of dust and gases which leads NEOWISE’s wavelength detector to capture the strong signals as seen in the red areas. Comet Lovejoy is expected to be the brightest comet in Earth’s sky for early 2015. Before its eventual landing on Comet 67P/Churyumov-Gerasimenko, this would have been the closet view that we had seen of a comet. ESA’s Philae lander took this picture of the comet while it was descending towards it, from a distance of just 130 feet (40 meters). 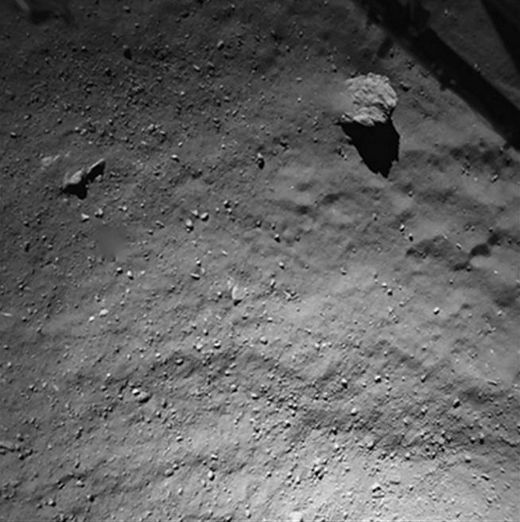 This picture was taken using the Rosetta Lander Imaging System (ROLIS) which is mounted on the bottom of Philae. We can clearly see that this comet is covered by dust and debris ranging from fine-grain particles to rocks of varying size. The slight depressions and elevations across the surface of this comet are also discernible from this picture. The European Space Agency’s Philae lander/probe separated from the Rosetta spacecraft and successfully landed on comet 67P/Churyumov-Gerasimenko. A great day for the ESA, the various scientists involved and for all space enthusiasts. In the future, we will hopefully be able to reap many more positive benefits from what was learned and accomplished by this bold mission to land on a comet. The “dark sides” of celestial bodies are pretty interesting to look at and this is not exception. 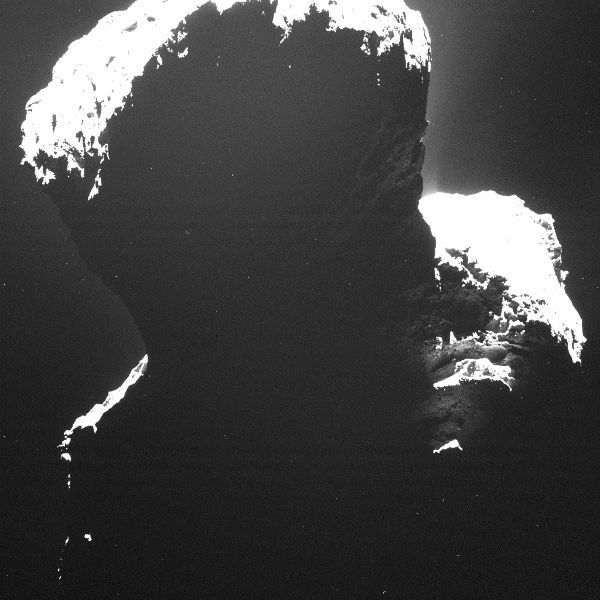 The ESA’s Rosetta craft took this rare picture of the dark side of comet 67P/Churyumov-Gerasimenk which it has been circling for the upcoming rendezvous with its Philae lander. Rosetta’s scientific imaging system (OSIRIS) snapped this picture in September, at a distance of just 19 kilometers from the comet and gives us some indications of surface structures. November 12, 2014 is just five days away and this is when the historic mission to deploy the European Space Agency’s Philae lander on comet 67P/Churyumov-Gerasimenko will occur. The Rosetta spacecraft has been orbiting and scouting this comet for many months. Rosetta used its on-board OSIRIS narrow-angle camera to take this picture of the comet’s surface from a distance of just 30 kilometers. 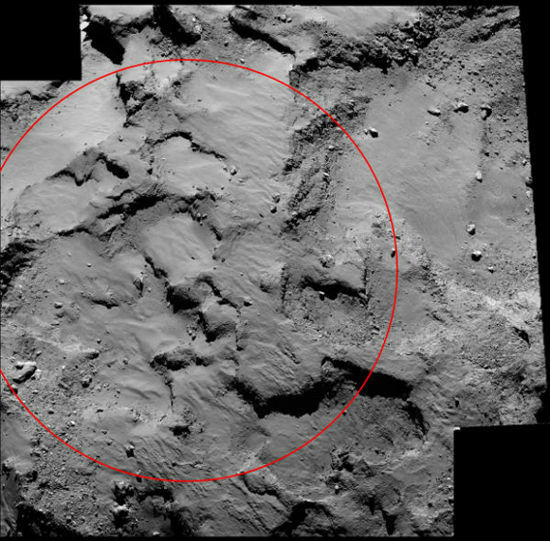 The circled area is designated “Site J” – the primary landing site for Philae on this distant comet.